BlinkFX offers a patent pending wearable battery powered LED light system that is versatile, affordable and is a DIY solution. Controlled by industry standard DMX512 protocol lighting controls, BlinkFX wearables allow you to generate 24-bit color light in a variety of special effect patterns and make every member of the audience part of the lighting palette at your event. Now you can engage your audience more deeply by making them part of the show. The BlinkFX 360 All-In-One wristband is our most popular style and makes enough light to be visible under stadium lights and most house lights. The 360 All-In-One may be custom branded and includes and on/off switch and mode cycle button for offline use. Each unit includes (2) CR2032 button cell batteries and has a life of up to 6 hours of continuous use. 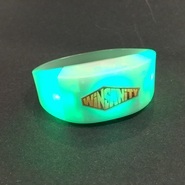 The silicone wristband is one-size-fits-all making it easy to deploy at events for all ages. Buy online or call for a custom quote. Intelligent and adaptable, the Wink responds to industry standard DMX lighting control commands and even does a few special tricks! Sliding back plate allows the Wink to be secured to a wristband, lanyard or clothing loop. 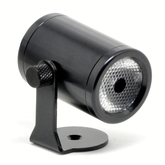 Optimized for 25mm x 2mm band size and other mounting options. BlinkFX wireless control emitters are fully plug-and-play compatible with industry standard DMX512 lighting controls to make it fast and easy to integrate wireless, individual wearable lighted devices into any show or event. BlinkFX uses industry standard DMX 3-Pin XLR cabling and connectors and is completely cross-compatible with existing DMX control hardware and software. Integrating BlinkFX into a light show is as simple as adding our infrared control emitters to a DMX universe in serial and addressing them just like any other device controlled by the master DMX lighting console. BlinkFX wearable devices include tri-color LED lights which may be programmed and controlled just like any LED stage light, PAR can light or wall washer. Show designers can create a wide range of colored light and effects through DMX pre-programming or live board control. The BlinkFX system seamlessly translates DMX commands into IR wireless instructions which control each individual BlinkFX Wink device. And special effects like twinkling can be achieved through simple DMX commands. BlinkFX has partnered with Gantom, the leader in brilliant miniature DMX lighting fixtures, to create a custom version of the Wink LED light disk and DMX control emitters. Designed specifically for walk-through attractions like museums, exhibits and haunted houses, the control emitters are small, discreet, and easy to program through our free iOS or Android smartphone app. 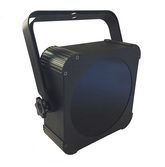 Special effects like color wheel, candle flicker, power fail and others are easily loaded to the mini control emitter which controls BlinkFX light disks in rooms and corridors up to 50 feet long and 25 feet wide. The control range may be easily adjusted through the emitter power setting feature in the programming app. And the LED disk firmware has been customized for walk-through attractions. When the disk fails to receive a signal it blacks out until the next time a signal is received. 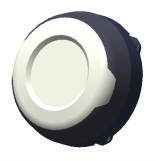 This allows placement of a single controller in select areas to be lit and easy blackout of other areas as no additional controller is necessary to send blackout commands.